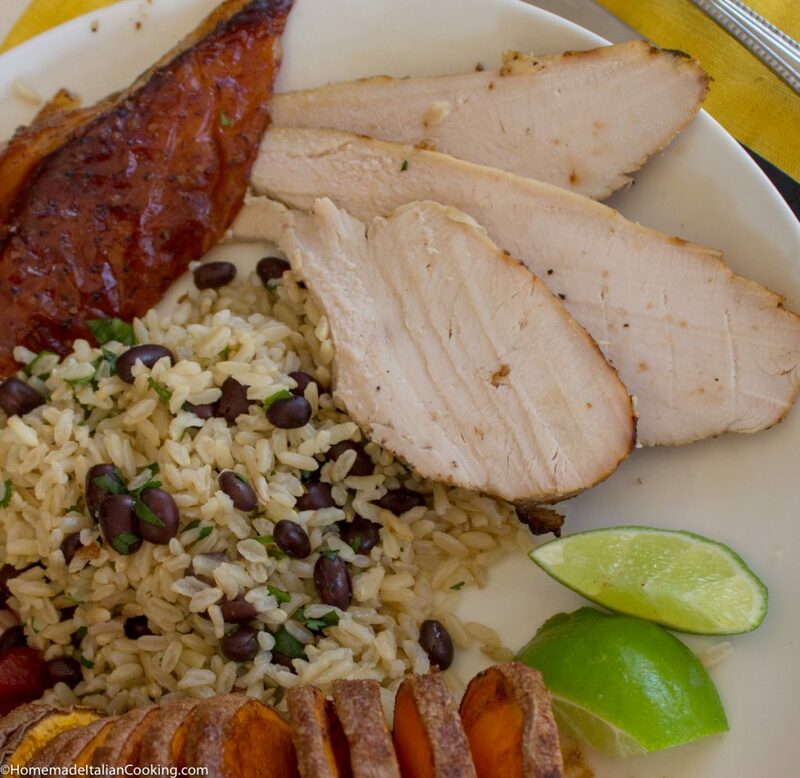 Cuban Turkey Mojo Criollo is my new favorite way to prepare a turkey. The secret is to marinate turkey in Mojo Criollo, a delicious and famous Cuban marinade of citrus juices, garlic and spices and then slow roast in the oven until the meat is juicy and the skin is crisp. I was inspired to try Turkey Mojo Criollo by my favorite Cuban friend Rey, who roasts a whole marinated turkey on the grill! 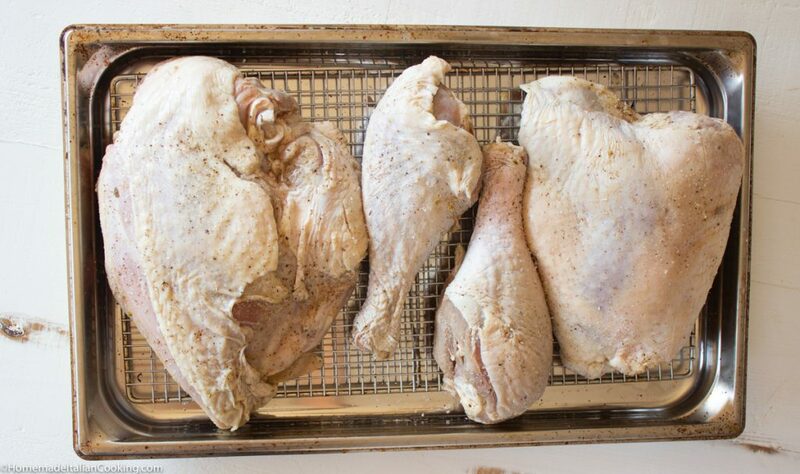 My version is the easy way – using turkey parts roasted in the oven. 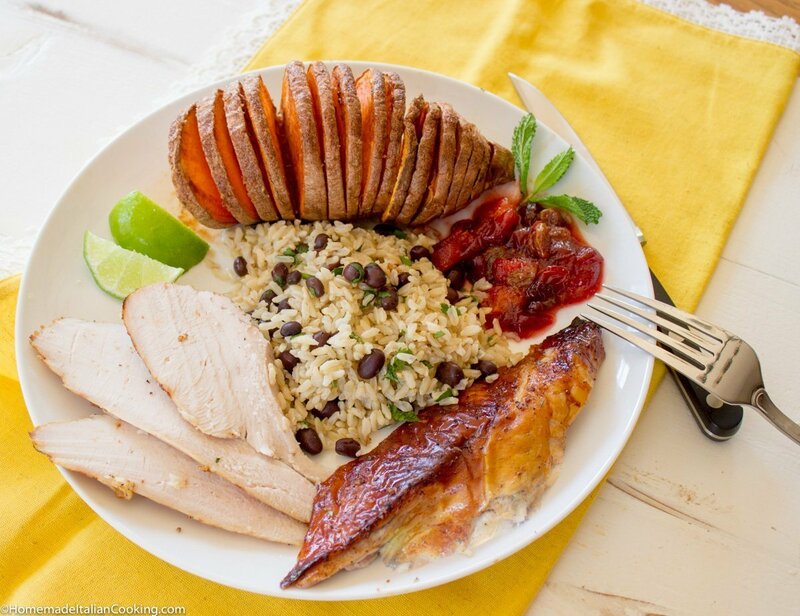 I served the juicy and flavorful Turkey Mojo Criollo with a Hasselback Sweet Potatoes, a tart and sweet homemade Cranberry & Tangerine Chutney with Mango and a scoop of Brown Rice & Black beans with Cilantro and Lime. Yum! If Cuba had a Thanksgiving traditional meal, this would be it. There are many wonderful homemade versions of Mojo Criollo, however, for now, I chose to make this an easy recipe. 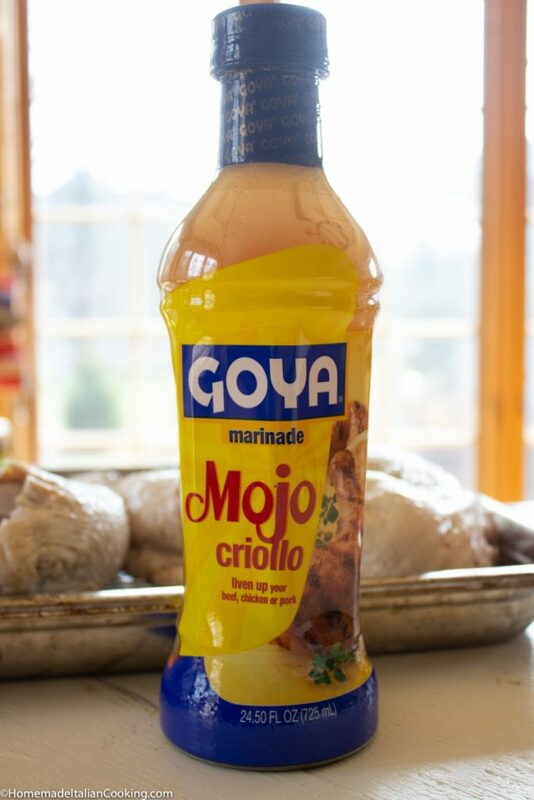 I went with a large bottle of Goya brand Mojo Criollo marinade and pre-cut turkey breast, thighs, and legs. A basic Mojo Criollo marinade calls for orange juice, lime juice, lots of fresh minced garlic, olive oil, cumin, oregano, salt, and pepper. It is also wonderful on pork, beef, and chicken. Marinate the turkey in the Mojo Criollo marinade overnight in the fridge. Roast in a hot 450 F oven for 30 minutes, then turn down to 325 F and roast another hour or so until juicy and crispy. Let rest and carve. Serve Turkey Mojo Criollo with all the trimmings! Marinate turkey with the whole bottle of Mojo Criollo marinade in 2-gallon ziplock bag and allow to marinate overnight in the fridge. Preheat oven to 450F. Place rack in a baking pan. 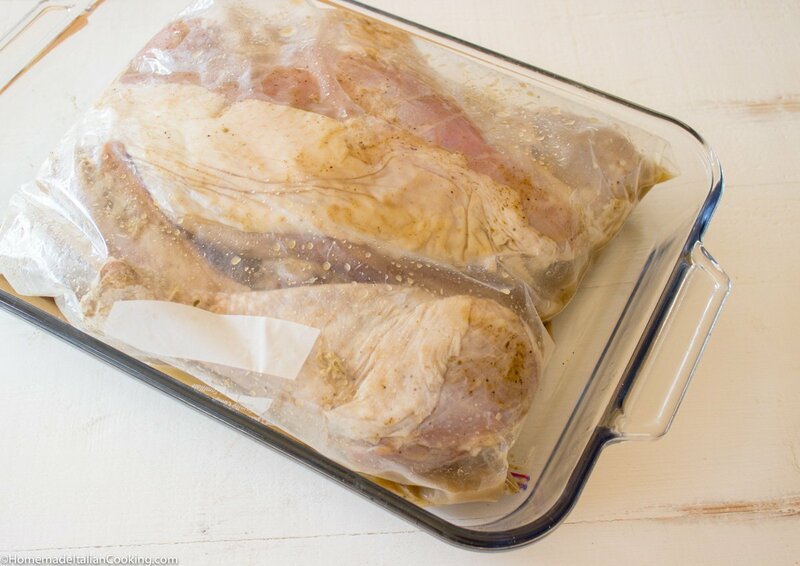 Remove the turkey from the ziplock and pat the pieces dry with a paper towel. Sprinkle with salt & pepper. Place the turkey, skin side up, on the rack and place the pan in the oven. Roast the turkey for 20 - 30 minutes or until the skin starts to crisp. Turn down the oven to 325F and let roast for another hour or until breast meat registers 165. Remove breast and set aside to rest. Do not tent. Let thighs and legs cook until cook another 10-30 minutes or until they register 165F. 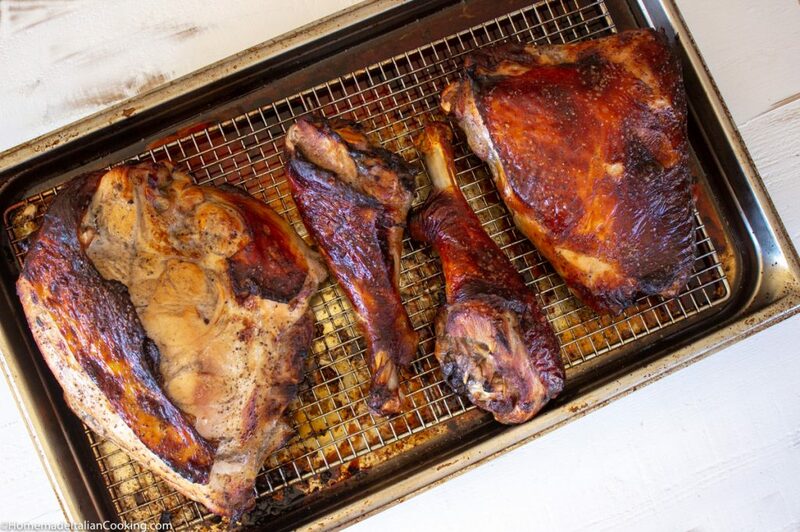 Let roasted turkey rest 30 minutes before carving.